This pile used to be my Phentex slippers. 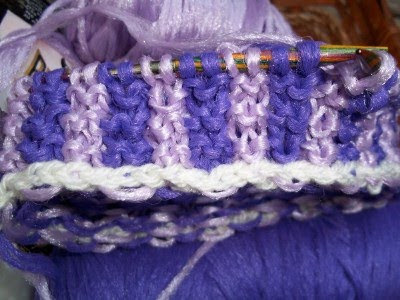 I realized several inches in that I was doing a 2/2 stripe when I really wanted a 3/3 stripe. While I had everything apart, I tried the provisional cast on for gathering. FAIL. 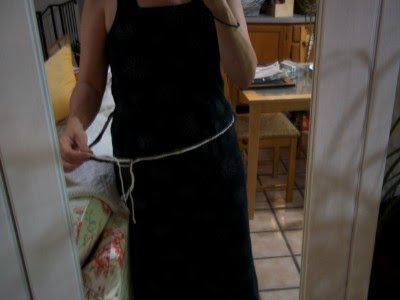 Then I tried to cut and sew down a seam. The results were not too bad. I was cautiously encouraged. 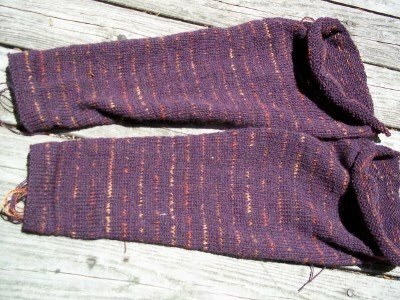 I cast back on from the heel side this time and added a 12 stitch stockinette steek. I intend to knit merrily along until the time comes when I realize I have another major goof on my hands. You just know it's coming. How do men do this to their socks? 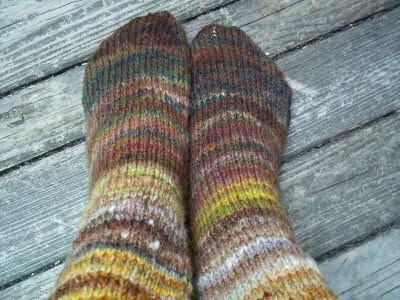 I have like a zillion pair of hand knit socks that I wear all the time and NEVER have I EVER done this to a pair. Never. Ever. I am NOT going back to school this year, but I am still finding myself lurking in the aisles of all the Back to School displays. 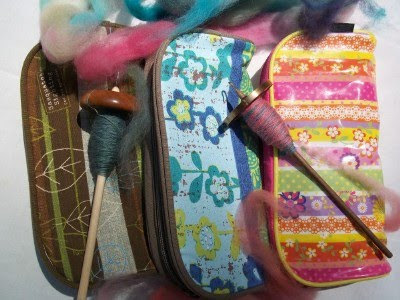 Pencil cases have always been a passion. Each year, my students would show up with the cutest little cases that would be perfect for transporting my spindles in, but by the time I got to the stores all the best ones were gone. Not this year. Since the sight of school supplies doesn't fill me with dread any longer, I have managed to collect quite a few. The Clun Forest staple length is so short, combing was not an option. 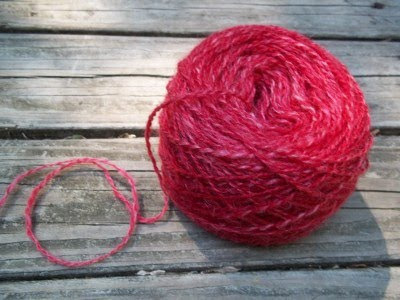 Out came the carder, on the dining room table, because it is just too frickin' hot to do anything outside. My goal is a batt a day and if the phone stops ringing, I just may meet that goal. Maybe. C'est dommage. 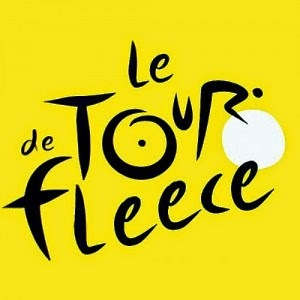 I DID spin everyday but I only managed to complete a teeny tiny fraction of my Tour de Fleece goal this year. 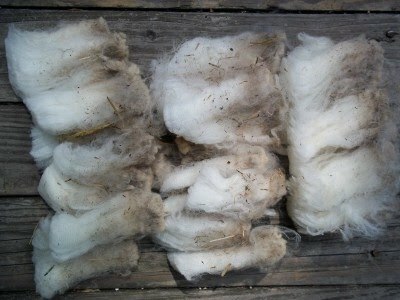 I watched almost all of it but could not bring myself to handle wool in 100 degree temperatures for any length of time. Pardon the amount of skin showing here mais il fait CHAUD. Last year I spun enough wool to make an entire sweater AND a pair of socks, this year I didn't even fill up one bobbin with my lovely Cormo. Here is this year's official total. Not much to show for a month. 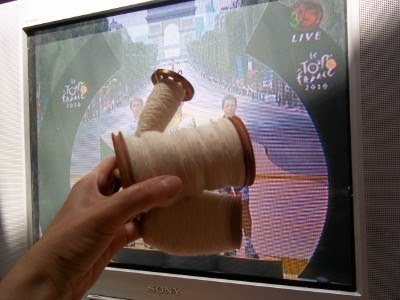 Nothing even got plied. My new goal is to see how much of this stuff I can spin before next year's Tour. 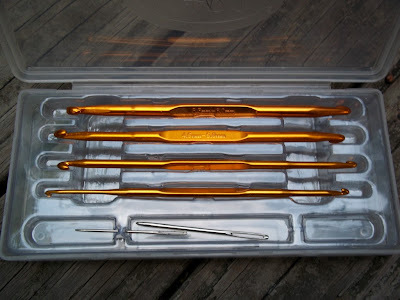 I have not crocheted in many, many years but when I saw this set of hooks from Knit Picks for only $4.99, I could not resist. While waiting for my hook kit to arrive, I dug up a few old hooks and some leftover Vanna yarn from the weaving stash and practiced on a few hexagon motifs. Cheapo acrylic makes the best warp so I have tons of it. 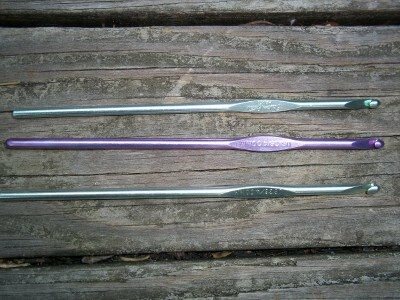 I had a good old time hooking away with my old hooks. 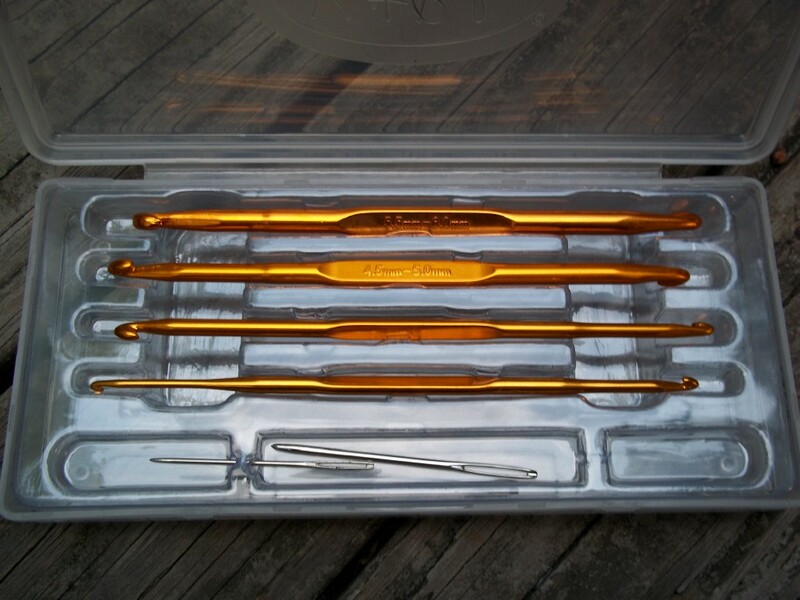 When my new kit got here, I sadly discovered that the best thing about them was their box because I hate the shape of the Knit Picks hooks. I am NO crochet expert but I AM fussy about the hook shape. 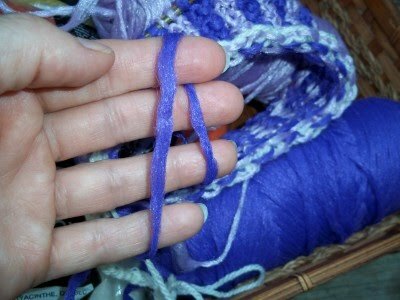 The shallow rounded dome that some hooks have leaves me frustrated when the yarn continually slips out and off the hook. 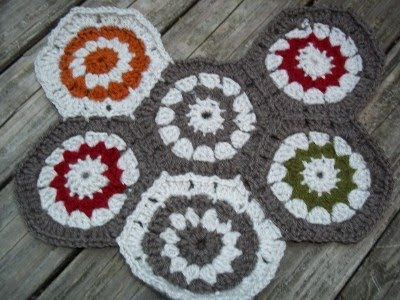 Sorry Knit Picks, I am a huge fan but I am sticking with my good old Susan Bates. They get the job done. 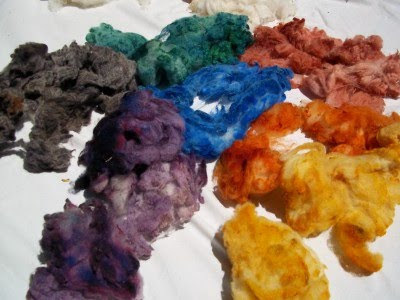 Today, being the last day of the Tour, I should be posting all the yarn I managed to spin but instead, I am more excited to share my new discovery. 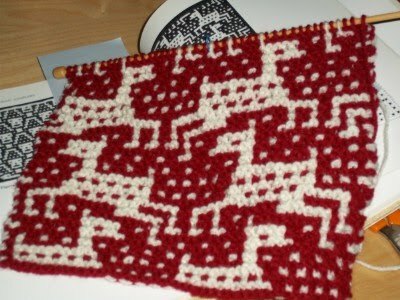 Mosaic knitting is ridiculously fun and fast. 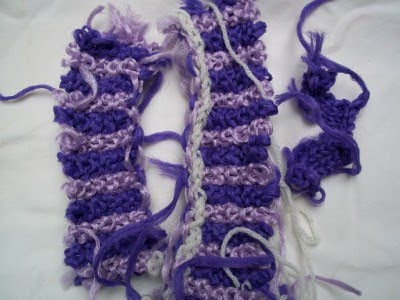 It is all garter stitch, you only use one yarn at a time and you just slip stitches to make the color changes. 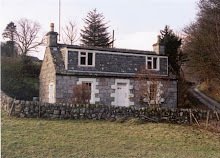 It is such a welcome change from fiddly old Fair Isle. Barbara G. Walker, I love you. Those Tour pictures will get posted as soon as it is cool enough to go outside and take some photos. The heat index was 112 here today and the humidity, well, let's just say a goldfish could probably live all day out of the water. 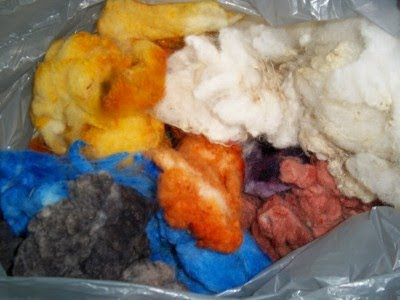 My goal was to wash, comb and spin as much of this bag of Cormo as possible. I started out the Tour by washing a 5 gallon bucket full. The weather was very uncooperative. 100 degree days. High humidity. 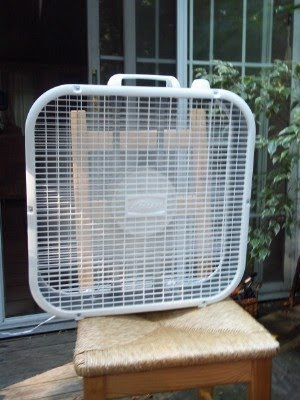 Whenever I got the slightest break in temperature, I set the fan up on the deck and worked like crazy to get something done. 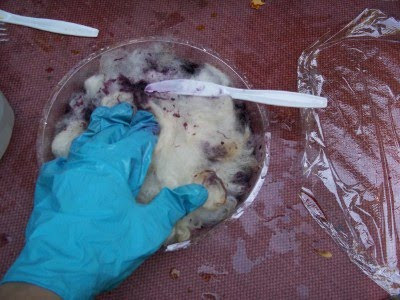 Separating the greasy locks for washing was a total joy but pots of steaming water was not. Although I did not do a lot during the Tour this year I learned a lot about Cormo. It's so fragile. 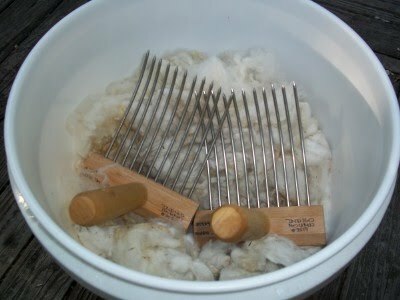 It turns to cotton candy after washing so combing is a slow and careful process. 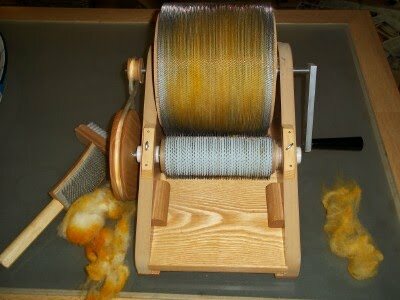 So far, I have 3/4 of a bobbin full of spun fiber and 1 and 1/2 spindles full. Not much to show, I'm afraid, for a month's worth of work. In fact, I'm not going to bother even taking a photo of all those boring white singles. Not yet. I made this cute little ball with my new toy. 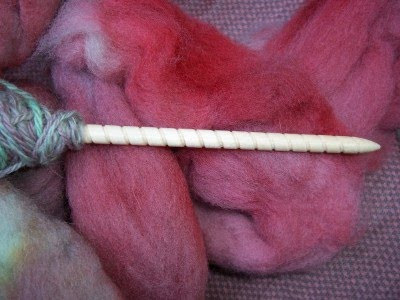 I needed a new, larger spindle for plying and I am so happy I found this fantastic one from Michigan Spinning. It is light, it has a 3 inch whorl and it has this wonderful spiral shaft that keeps everything from sliding around. 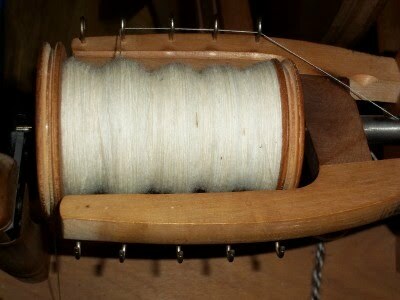 My poor neglected Finn Top singles got themselves chain plied in no time at all. 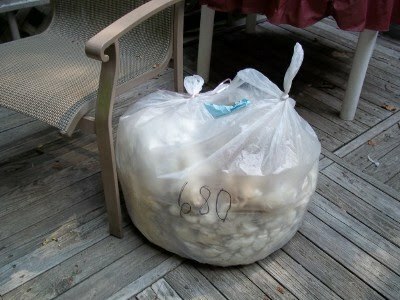 I may even finish spinning the rest of the bag and then knit it into something someday. I love my crazy old lady Phentex slippers. I really do. After all the horrible things I have put them through, they still look and feel great. So why am I attempting to knit another pair? 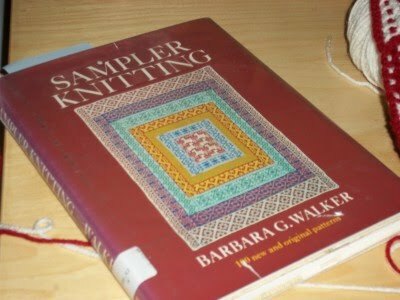 Because of Ravelry, that's why. I was contacted a few weeks ago by someone who was very curious about the ones I have posted on my project page. 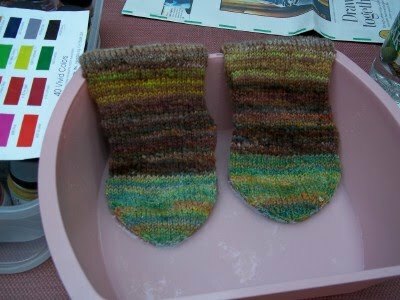 I decided to go dig through my stash where I found a ridiculous amount of the scratchy plastic slipper and craft "yarn" and the next thing I knew I had cast on another pair. In the round this time. I am actually going to try and steek this crazy stuff at the foot opening. 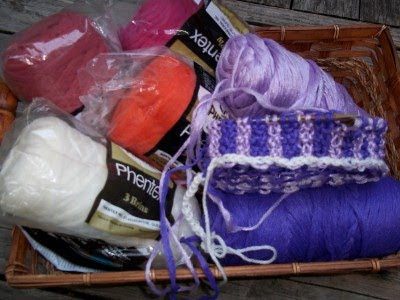 If you have never had the pleasure of knitting with plastic filaments, you should give it a try. It's like nothing you have ever felt but it makes amazing slippers. 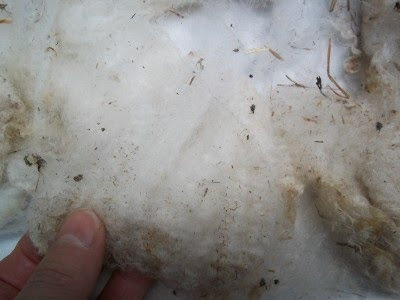 Phentex is hard to find in the USA. I get mine from Yarn and Thread by Lisa. I know fish swim in schools not flocks but I don't even want to think of schools in July, even if I am retired. These things are starting to swim along rather nicely since I got out the stitch markers to help me keep track of the pattern. Duh. 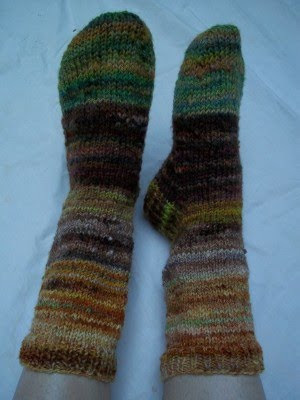 I think I am a pretty good knitter until someone asks me to make them something specific and I just can't pull it off. 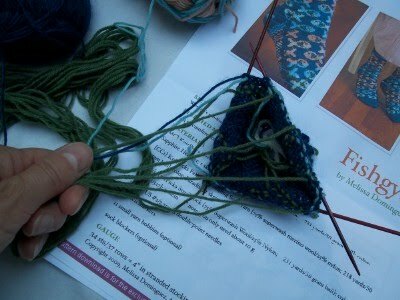 Daughter fell in love with the Fishgyle sock pattern from Knit Picks. I waited 3 months to start them because the argyle criss-cross color was out of stock. The green finally arrived so I sat down and gave them my best shot this week, but managing all those separate strands was too much. 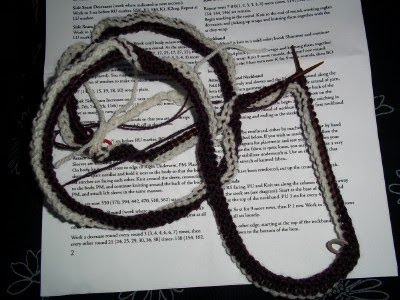 I spent more time untangling than knitting. I tried every trick I could borrow off the internet with no luck. 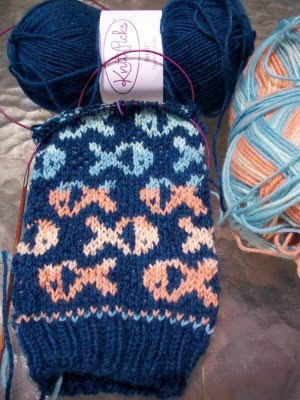 I should have taken everyone's advice over on Ravelry and just knit the damn fish without the argyle part in the first place. 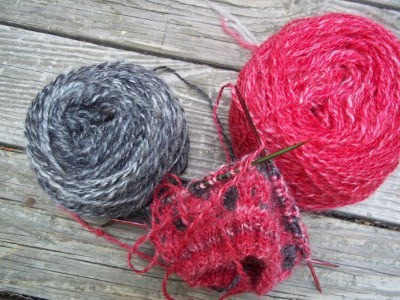 The Ladybug spun up 4 ounces of the Mohair, Icelandic, soy and silk sock fiber in no time at all. 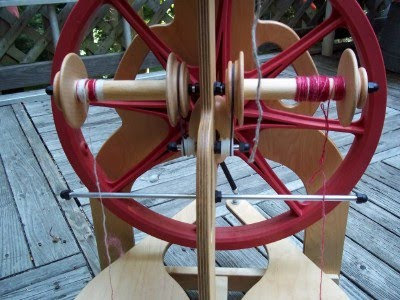 After treadling away on my elderly pre-owned Ashfords for several years, having a new wobble free wheel is like driving a luxury car. 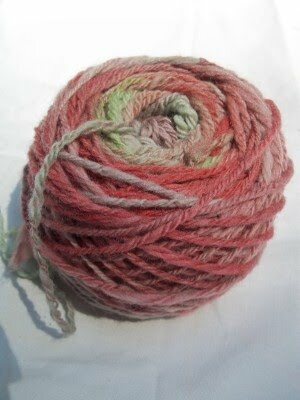 Although I usually hate Mohair, I love the feel of this 2 ply yarn and the way if absorbed the dye. Of course this project is not worry free. I have 76 grams of the red and only 33 grams of the black so I am afraid I am not going to have as many black spots as I wanted. As I was peddling furiously on my little bug spinning and then plying the singles, it all of a sudden dawned on me that I just may be over spinning my poor little balls of wool. I have never used a double treadle before and I was getting a pretty darn good workout from it. I was very relieved that all that intensity did not ruin my yarn. 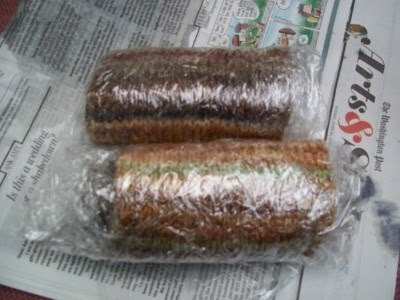 My first ever bug spun sock yarn turned out just fine. Little Miss Ladybug got a present. After spinning two bobbins of red wool for my ladybug inspired socks, I realized that her bobbins are too big for my Ashford lazy kate. I ordered her very own tensioned lazy kate that installed very quickly and worked extremely well. 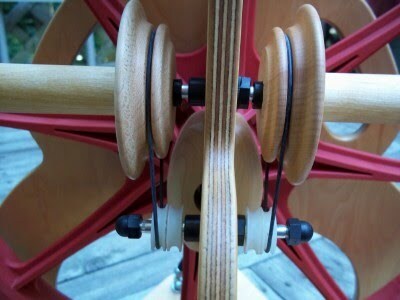 I have read negative reviews of the attached rods spoiling the look of the wheel but I love not having to fiddle with an additional piece of equipment when I am ready to ply. Pretty is as pretty does and my bug is still a real beauty, rods and all. I love her. 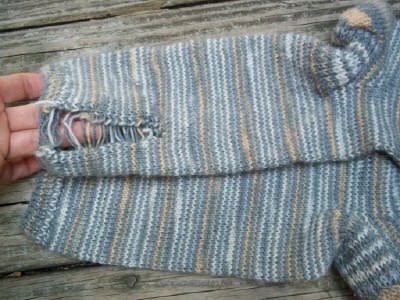 I had great misgivings about casting on the body of my Classic Lines Cardigan. I was right. It all went bad. 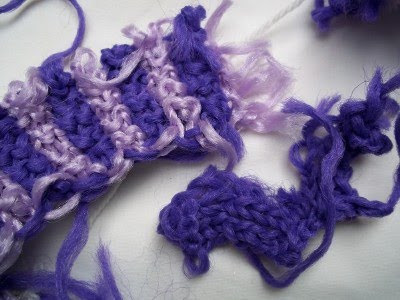 First, twisted stitches bad. Then way too big bad. That's a lot of bad in one place. 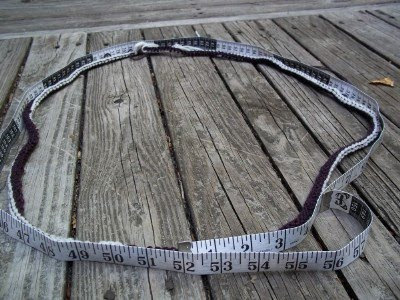 I cast on the right amount of stitches and I used the same size needles but I am coming up with 52 inches of sweater for my 36 inch size. This is going to take some thinking. After countless attempts at getting the two sides of this tank top together correctly, I finally think I did it. Kind of. 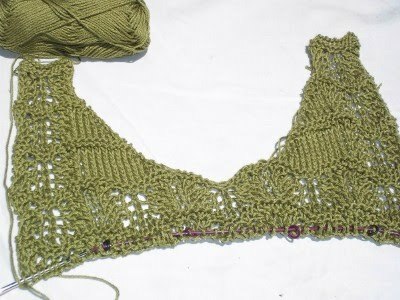 I totally wimped out on the neck edge lace panels. I opted for the stockinette stitch version instead of the partial lace pattern version because I am a total idiot who couldn't figure out how to do it. I hate implied instructions. 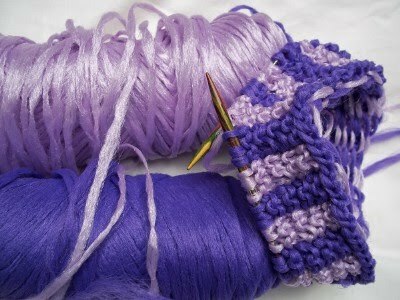 If you have designed it and knitted it yourself, you should be able to tell other people how to do it. Even if it is a free pattern. I've got both sleeves done and it is now time to cast on for the body but for some reason I am freaking out about using that knitted-in hem with so many (230) stitches. 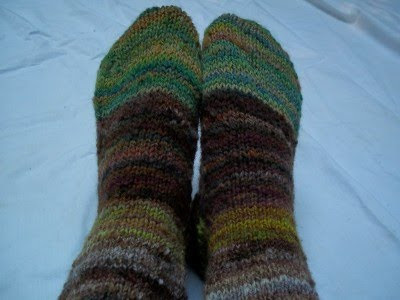 I better get over it or I am going to have to turn these things into leg warmers. 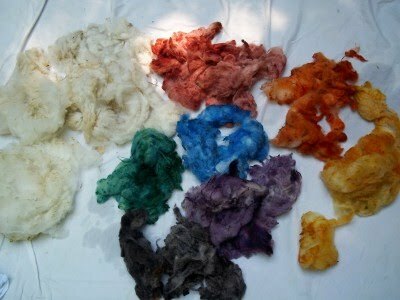 After washing the Clun Forest, I decided to have some fun with it. I have been combing and spinning plain white Cormo non-stop for weeks so I got out all the dyes and used some plastic flower pot thingys to dye a rainbow of wool. In the steamer the colors looked a little washed out. 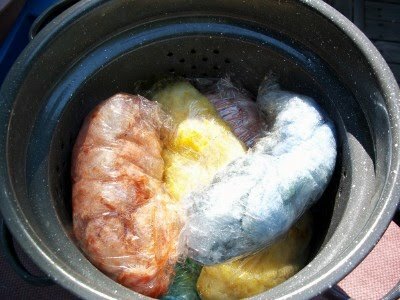 After steaming they were all nicely shaded with lots of variations within each color. I can't wait until this gets dry enough to comb-or card. I'm still not too sure which way to go with it. 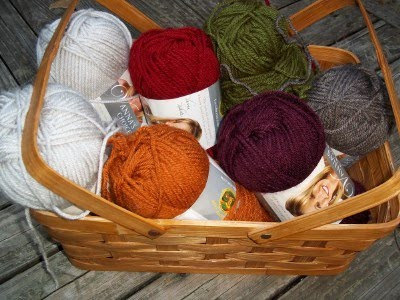 I see some fun mitten knitting in my future. 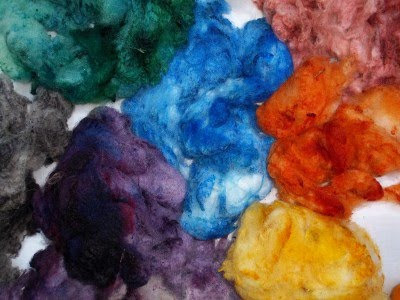 It's not really too much of a budget breaker because I have allotted $25 of my monthly pension check for fiber or other yarny stuff. 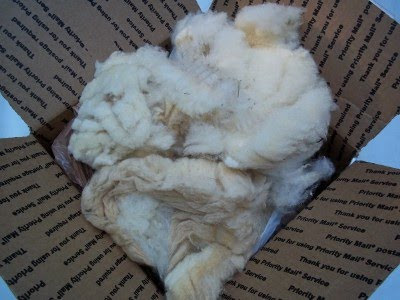 For less than $20 I got a pound of raw Clun Forest wool from Springtree Road to play with. 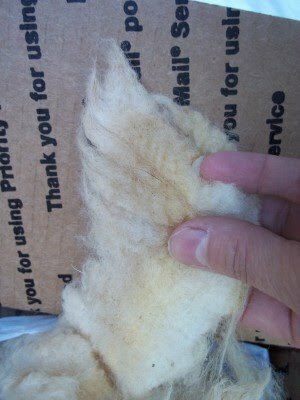 It took me a while to decide to buy it because all the lovely Cormo has spoiled me for scratchier wool. 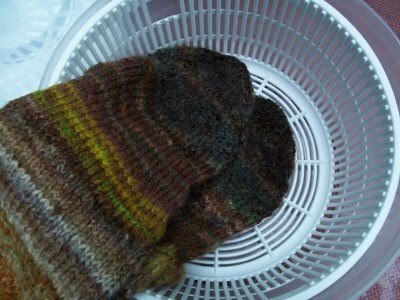 I am thinking of dyeing it in different colors and spinning some rustic wool for mittens. This hot summer won't last forever. I just couldn't stand them. Those toes had to go. Jacquard Chestnut to the rescue. Oh, oh, they looked too dark when wet. After drying they were better. Not perfect but better. Go ahead. Have a giggle. I deserve it. 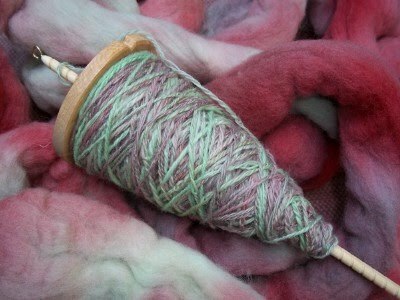 The last batt was a complete bust for my Corriedale Chain Plied socks. I knew it. Too blue, too green. Not enough brown to balance the other colors. I seem to be having lots of toe issues with socks these days. I am going to put these in time out for a while until I decide if I am going to over dye the offending digits or just leave them be in order to teach myself a lesson in restraint.